Our pre-designed template styles are obviously not going to fit the standard definition of a template site. Your professional design will impress visitors, increase lead generation. You will be able to fully customize the site with our advanced content management system.In fact, the only thing template about these sites is the price. Sign up today sites ssl today! Your website is fully responsive (meaning it responds and resizes to fit the screen whether its a desktop, laptop, smartphone – iPhone, Android or tablet) and comes pre-built with compelling content. In addition to having the most professional looking web site – you will have the best written content. Of course if you want to change any of the wording to custom fit your business, you can easily do it. Additional Loan Officer sites are available for larger companies. We are leading the way with our secure mobile document uploader. Your borrowers can just take a pic of their documents with their phone and securely upload it to your back office! They can also scan documents and upload them using a computer. You can give them a checklist of items needed and they just check it off as the upload items. Individual loan officers can be selected and loan processors can be given notifications of uploads too! Customizable checklist of items needed! Your web sites includes a complete email solution as well. 10GB of storage per email box. Easy to setup and use with instructions for all major devices! Our landing page wizard is one of our biggest breakthroughs in lead generation marketing. In case you aren’t sure what a landing page is (also known as a squeeze page or doorway page) its a one page website designed to generate leads for a specific product. Our landing page wizard allows you create up to 25 unique landing pages for different campaigns and products. Each page contains your logo, phone number, a brief product description and a lead generating form. 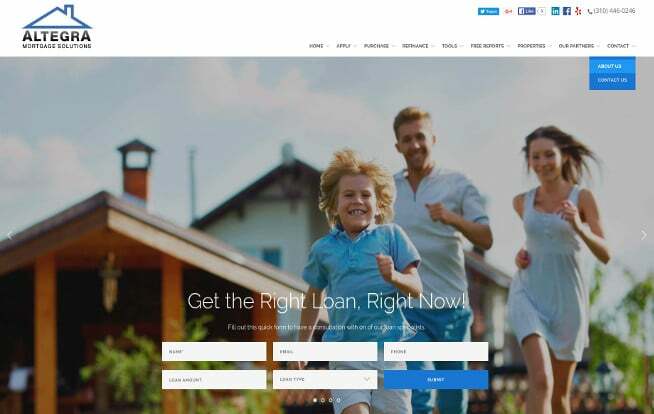 You can create a search engine and customer friendly URL, for example you can have yoursite.com/refi or yoursite.com/FHA that directs to specific landing pages. The possibilities for landing pages are endless but they are designed to be used with specific campaigns and advertising tie ins like PPC. If you are advertising on a rate site like bankrate.com you can redirect visitors to a landing page for the program you are advertising – this is much more effective in lead generation than directing users to your traditional home page. You can also develop landing pages that work with your networking. For example if you are working with a realtor you could create a landing page with their logo and promote your co-branding will growing business. The landing page wizard is included with the premiere package. Our new live chat module (included with premiere sites) allows you to chat live with your site visitors as well as view who is on your site and what city the are in AND you can invite them to chat to pro-actively engage your site visitors! No digital presence is complete without a blog. We’ve included a top end design, you can post to your blog anytime but if you’re too busy… PostBot will post for you! If you work with realtors or other professionals that refer loans to you, they often want to know what the status of those loans are. With our referral loan tracking, they can login and view the status of the loans that they referred to you. With our revolutionary new social media plugin you have your sites automatically display your networks. A custom facebook company page that puts you in the top tier of facebook company pages. AND our anytime one post module allows you to do one post that updates to your facebook, twitter and blog and you can schedule the posts for anytime in the future. How says that to be a social media master you have to constantly post and update a million different apps? Do you want to add property listings to your site? Have google map power search? Feature realtors you work with listings? You can do it and of course its all state of the art 2012 developed code. You’ll have images, features, google street view, and more! Included with the premiere package. First you need a professional looking web site (if you have a badly designed site or a cookie-cutter design, you can have great content but a lot of borrowers won’t bother to read it, because they won’t trust doing content from a poor looking site). In addition to having a top of the line design, we provide you with whole library of compelling pre-written for your site. We will provide you with a ton of pre-written content, but of course you might want to personalize your site. In fact you can do just about anything from: changing tabs, links, adding pages, uploading photos, pdfs, powerpoint, and even video! And you can do all this yourself with any easy to system. No waiting days and paying extra to make a change to your site. If you have special loan programs you want to emphasize or if you just want to change some text to fit your companies style – its all up to. Of course or content management system is easy to use! We don’t use flash on any of our new sites! You may have heard flash doesn’t work on your iPhone, iPad, Android smart phones and tablets. So we replaced flash with 100% mobile compatible slideshows. All of our links, tabs, navigation menus are fully optimized for mobile as well. Don’t worry about forms either – you’ll get all your leads even if they come from someone viewing your site on a phone or tablet! A great way to increase traffic to your site, increase your search engine and improve your business networking is by using our Business Partner Referral Network! This is a win-win for you and your business partners. You can add your partners logo, url, description and they can do the same for you. This win-win builds traffic, increases seo and enhances both our sites. When you purchase one of our web sites you are going to have the most compelling content available with a wide variety of relevant pages like: purchasing, refinancing, imperfect credit, the list goes on but you might have a special niche or program that we don’t have a page pre-built for. That is why we allow you to easily add new pages to your site. Easily protect certain pages on your site from the general public. Restrict access to your back office and training materials and more with password protection. **, ***, ****, *****= Call us for detailes 1-877-821-5451 or contact us here. With our elite plan you will have a personal webmaster – to help you customize your web site! Our professional design team will make sure your site is properly setup including help with social media, logo, staff, testimonials, companies you partner with and much more. We will meet with you to determine your target market and then optimize your site for up to five sets of keywords as well as optimizing for local search. We will setup and manage your PPC campaign including landing pages and ad work.